It’s been a while since I have posted a favorites blog or vlog. Since I have been using a lot more drug store products lately I have found some great items that I absolutely adore and I thought now would be a great time to share my current favorites. Most of these items are under ten dollars and were purchased on sale and with coupons at Walgreens, Rite Aid or Target. I have provided links below for more details regarding the product. Note some of these links are affiliate links as an FYI. This is a must have in my collection. I use it as an eye shadow base no matter what eye look I’m doing for the day immediately after priming my eyelids. Obsessed about this lip treatment is an understatement. I put it on multiple times per day because I love how it smells & feels on my lips. My lips have never been as moisturized as they are now after using this stuff religiously and it will be a permanent staple in my makeup bag/purse/night stand. I had low expectations for this palette when I bought it but was pleasently surprised how amazing the colors were. They are pigmented, super blend-able and you can create so many versatile looks with the palette (day time/night time, office appropriate or night out etc). I also love how you can remove the pans and customize the palette. That’s pretty impressive for the price point. I adore these! I have three shades so far. I’ve swatched them below. As you can tell I’m mildly obsessed with nudes at the moment. I also love how these smell like vanilla. 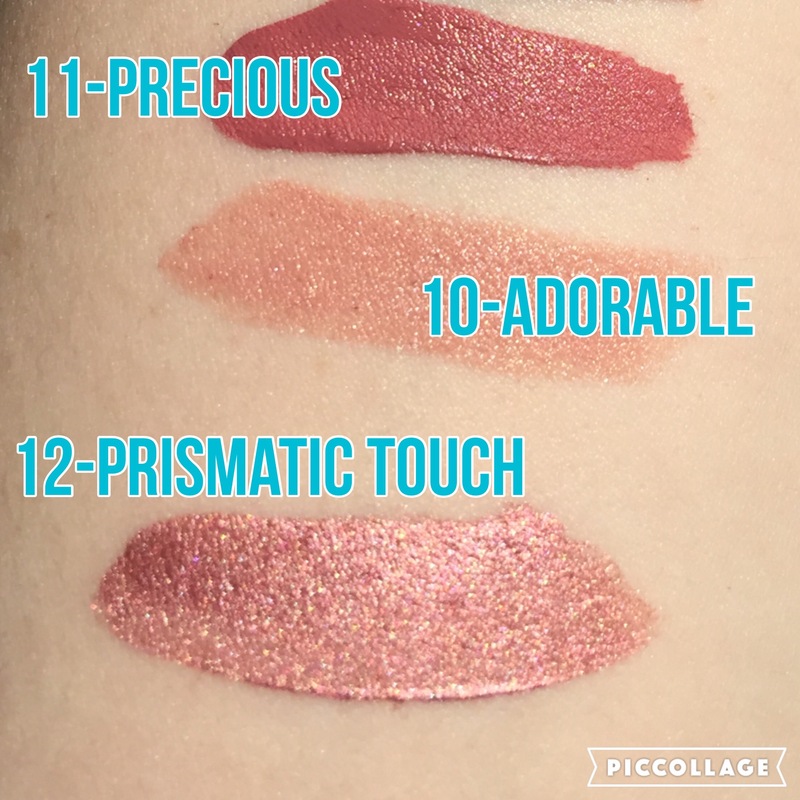 So many of my other liquid lip products have gross chemical smells to them which turns me off from using them, but not these! They dry quickly, but don’t dry out your lips and they last a long time wear wise. The bottom one is the only one of the Metallic ones I have. I found this at the grocery store on an end cap with a tear off coupon pad attached and thought “why not try it out”. I ended up absolutely loving it and am devastated to find out it is limited edition and no longer available. I love how the shade is kind of an ashy/gray shade which makes it perfect for contouring. I like to use my bronzer to contour on most days (because I’m lazy and usually putting on my makeup as quickly as I can in between bottle feedings and diaper changes for Baby K). So this is perfect for a Mom on the go with fair skin like myself. Out of all the setting powders I have tried, both high end and drug store this is hands down my favorite and the most affordable of all. It’s less than $5! What a steal. The only thing I don’t like about it, is the super cheap packaging (to be expected for the price point). The clear plastic lid falls off in my makeup and always seems to break or crack no matter how careful I am with it. That won’t stop me from buying it though because it makes my makeup stay in place for 12+ hours and doesn’t make my face look cakey. Only tried this because I got a great deal on it via a drugstore sale and paired it with a coupon but it’s now one of my go-to drugstore mascaras. It really makes my lashes look super voluminous and fake as well as adds some length to them. I usually wear 2-3 coats of this on my lashes and do not pair it with any other mascaras. If I want a more dramatic eye look I do a base coat of a lengthening and separating mascara first and then add 2-3 coats of this and I’m out the door and ready to take the day head on! This highlighter has been mentioned so much but that’s because it deserves a shout from the roof tops. It’s stunningly beautiful for a drug store highlighter. Wet n Wild has really stepped up their game with their makeup, while maintaining the affordable prices they are known for and this highlighter is probably one of the best Wet n Wild products I’ve gotten to date. This is all I have been wearing this month and couldn’t be happier. This foundation really is pretty awesome for the price. There aren’t many color selections though so it’s a shot in the dark regarding skin color matching but if you can find a shade that works for you then you will love this foundation. It looks great on, doesn’t make your face look too oily, is a great price, and is perfect for people with combination skin like myself. I wouldn’t say it’s the best primer I have ever used, as it doesn’t appear to do a great job of filling in all my pores, but it does make my skin have a healthy luminous glow that you can see after my foundation is applied. I’ve used it under all sorts of foundations and have been pleased with the results. It’s been pretty good and worth a mention but I wouldn’t say it has become my holy grail drugstore primer. 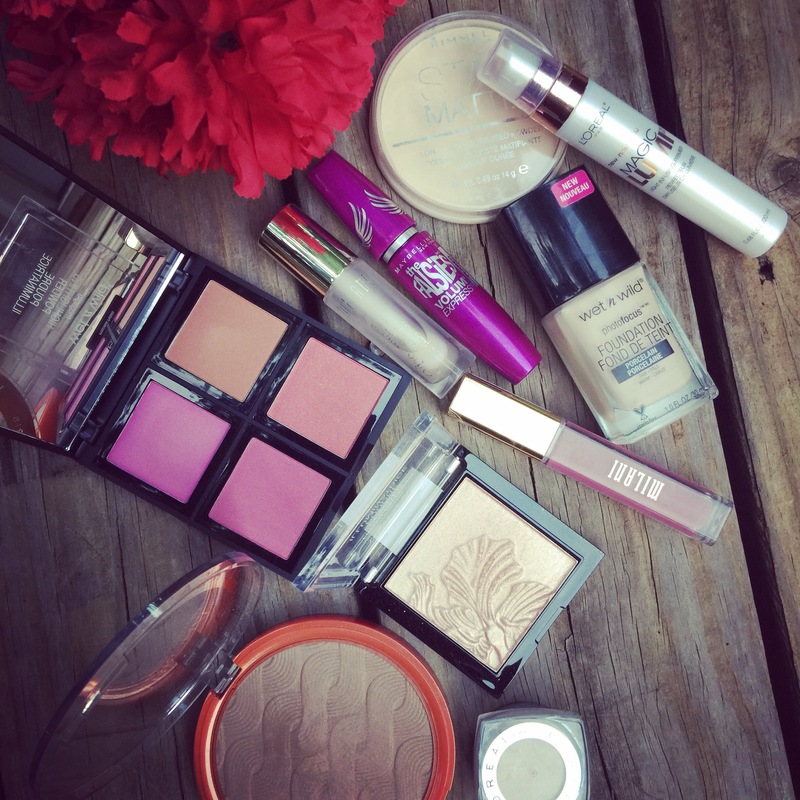 What are your current drugstore favorites? Have you purchased anything new I should try out? Comment below and let me know! Thanks for stopping by and don’t forget to like comment and subscribe. You can also follow me on Instagram Facebook or YouTube as well! That stay matte powder is amazing, If I can make a recommendation of an INSANE drugstore highlight that totally caught me off guard and yet I keep reaching for? The essence single highlight… it looks almost like a bronzer and super boring in the pan, but you put it in and it’s the most perfect flush, and only for a few dollars. Blows my mind to the moon and back. Thank you for reading! ❤️ I totally agree!!! Why aren’t more people obsessed with these. They are sooo affordable and don’t smell like chemical grossness. Lol. Everyone should be obsessed with these! Thanks for reading. Definitely try the mascara and let me know what you think. I have found recently that it does dry out quicker than I expected it would. Those lip colors are amazing!